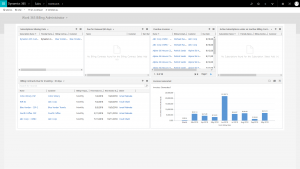 The Billing Administrator Dashboard contains both Insights and Action Items. This list shows Active Subscriptions that are missing data that is required for Billing. For Automatic Providers, Subscriptions may sync directly from Provider like the Partner Center. These subscriptions will need to be updated with missing fields like Billing Contract, Customer and Subscription Price Data. For Azure/Usage-based Subscriptions update the Markup field. Ideally, this list should be zeroed out. This list shows Billing Contracts that are about to expire in 90 days. The End Date on these Billing Contracts is within 90 days. This tile does not show Billing Contracts that are already expired. Use this to initiate renewals for your Billing Contracts and review pricing for your subscriptions. These are all overdue Invoices in the system. This tile shows all Invoices and not just invoices that are generated from Work 365. This tile can be used for collections. This list contains Active Subscriptions – that is not going to be billed to your end customers. These potentially cost you are incurring that you are not billing your customers for. This list should potentially be zeroed out always. This List shows they Billing Team the Invoices that will be generated for the Billing Contracts in the next 30 days. This will include Annual, Quarterly and Monthly Invoices that are all due for invoicing in the next 30 days. The system will calculate the Next Invoice Date based on the Invoice date and last changelog in the system for the subscriptions for the Billing Contract. Shows all the Invoices that are generated in the system.